Russian sports fans will remember 2012 for the national soccer team’s poor performance at Euro 2012, the stir around billionaire Suleiman Kerimov and his soccer club Anzhi, and, of course, the NHL lockout, which prompted the best players in the world to come and play in the Russian KHL. SKA St. Petersburg came into the season as clear favorites to win the Gagarin Cup. Nonetheless, the league’s richest club was crushed by Dynamo Moscow in the semifinals, 4-0. Dynamo then faced Avangard Omsk in the finals and was on the brink of defeat after falling behind 3-1 in the best-of-seven series. 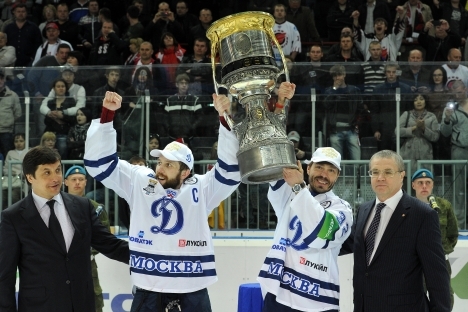 But Dynamo came back after winning three games in a row to claim the title for the first time ever on Apr. 15. The Russian national team, featuring all of its NHL stars, trounced Slovakia, 6-2, in the world hockey championship final. Unlike previous tournaments, the Russian team was not involved in any scandals this year. More than this, new coach Zinetula Bilyaletdinov was able to put together a team that worked together toward a common goal. After spending years watching his career gradually slip away from him at the perennial basement-dweller Atlanta Thrashers, NHL star Ilya Kovalchuk finally got a taste of the playoffs with his new team, the New Jersey Devils. He almost went all the way too; having practically dragged his team into the Stanley Cup Finals, Kovalchuk had the misfortune of coming up against an inspired Los Angeles Kings side that took the series and the cup with relative ease. Slava Voynov, another Russian NHL star, won the trophy with the Kings. This year, Maria Sharapova added yet another major victory to her already glittering tennis career. Maria was in fine form throughout the season, but really came into her own midway through the season. Earlier in the year, she had been no match for Victoria Azarenka in the Australian Open final; but a few short months later in Paris, she simply outclassed the field, losing only one set on her way to the finals, where she beat Sara Errani, 6-3, 6-2. This year’s major disappointment was the failure of the Russian soccer team at Euro 2012. Dik Advokat’s team was drawn in the weakest group, but still never made it out, losing to Greece in the last match of the group stage. After the game, Russian captain Andrei Arshavin made it clear what the Russian team really thought of its fans: “What you expect of the team has nothing to do with us, the players. That’s your problem.” New coach Fabio Capello clearly thinks the team is better off without Arshavin. It is ironic that sambist and multi-time MMA champion Fedor Emelianenko was only just starting to make a name for himself in his home country at the end of his career. His fans were extremely disappointed to see him lose a number of dramatic fights. Even the victory against Jeff Monson in Moscow was not enough to sweeten the bitter taste left in their mouths; for one, his opponent was hardly a world-class competitor. The crowd also seemed to be more interested in presidential candidate Vladimir Putin, who turned up to watch the fight. Emelianenko announced that his career was officially over, after fighting Brazilian Pedro Rizzo on June 21, 2012. As usual, the Russian Olympic team faltered during the first half of the Games, causing widespread dissatisfaction. The Russian athletes finally managed to get their act together and win enough gold medals to move the national team up to fourth in the medal table, following the United States, China and Great Britain. The men’s volleyball team became the enduring heroes of the Games, as Vladimir Alekno’s team defeated Brazil 3-2 in a dramatic final. Russian billionaire Suleiman Kerimov, obviously inspired by the sporting achievements of his “counterpart” Roman Abramovich, decided he would build a super club of his own. Kerimov lured Samuel Eto’o, Roberto Carlos, Guus Hiddink and some other stars to his Anzhi Makhachkala soccer club. This year, his investment paid off. Despite the resentment and even hatred of some fans, Anzhi climbed to first place in the Russian national championship and is playing well in the Europa League. The Russian national soccer team has been experiencing a renaissance following the Euro 2012 disaster. The defensive style advocated by Italian Fabio Capello has had an immediate effect: Russia has won all four of its World Cup 2014 qualifiers with an aggregate score of 8-0. A trip to Brazil in 2014 is all but guaranteed. Six new players have made their debuts in the national team under the new coach. NHL Commissioner Gary Bettman and club owners failed to reach an agreement on the collective bargaining agreement: the NHL Players’ Association refused to cut players’ salaries, something on which the league insisted. The lockout began on Sept. 15. While most of the local players stayed in the U.S. to wait for the results of the talks, Europeans crossed the ocean to play in the KHL. The return of NHL stars Alex Ovechkin, Ilya Kovalchuk, Evgeni Malkin and other stars to Russia has temporarily turned the KHL into the world’s strongest hockey league.